Today I want to share with you what I’ve been working on the past few weeks, off and on. We have three bedrooms and a bathroom upstairs and up until now, I had my crafting room in the one room.. So, now we decided to turn the above, nautical themed room into a family room since it is the largest one and move the youngest son into the crafting room. I moved all my supplies downstairs in the basement, which I love already since I do a lot of work in the basement anyway. For those of you that remember the twig reindeer paint mishap, you’re probably thinking this is a good idea, since it’s easier to go outside to paint now! To see the studio reveal from a few years ago click here. Note the ugly linoleum from the 80s. The first thing I did after cleaning everything was install carpeting. I took off all the trim and put padding down that we had left over from previous rooms. I bought a remnant piece of carpet at Williams furniture not far from here. (they have the best prices I could find in our area) I got a tip from someone once to stay away from the walls a half inch with the padding, so that the carpet will lay down nicely along the edges. This has worked quite well for me. I know most people probably staple the edges, but I haven’t ever and it stays perfectly in place with the trim resting on top. Here are some of the little projects I did for the room.. Since the bedroom suite was a twin sized bed and our son thought he should be upgraded to a full, we sold the set. We bought a mattress for him at our friend’s furniture store and they also had an under the bed drawer unit that they didn’t need for their store anymore so we were lucky to get that for free! Hubby cut it down for a full bed size since it was meant for a king or queen and I painted it white. Love the extra storage! I thought the antique handle added some character, so I left it on. My son also requested a pull down map, like they have at school, so I glued a world map that my mom said I could have onto an old blind I purchased at a thrift store for a few dollars. I hung it above his bed. We of course needed some sort of dresser for this room, since we sold the other one. I decided to swipe the TV stand and turn it into a dresser. The stand used to reside down at my little beach house before I redid it. It was actually part of a kitchen cabinet down there. I cut some of it off and put in a bottom where the drawers were to hold our players for the TV. That worked really well, with the extra storage to hold dvds, etc., but since we are in the process of moving the TV upstairs anyhow, I have another table in mind to hold it. I basically just used the Mod-podge to glue the map pieces onto the doors and after pressing them down firmly, I gave the maps a coat of satin Mod-podge. I did the same for the knobs..
Several years ago my hubby and I built this desk out of plywood and this will work quite well for our son to use to do his homework on or other little projects he has going on. The only wall I painted in this room is the one behind the desk. I think gray goes so well in a boy’s room. All the other walls are white. I had already had these canvas storage totes for my studio. These too, will work great to hold toys and other things you would find in a child’s room. At first the thought of moving to another room wasn’t very appealing to our son, but now he loves it. I think he was envisioning ugly flooring and the officey feel of a studio. It’s amazing how much change you can get in a room with carpeting,a little paint and cozy touches of photos, pillows and lights. I hope you enjoyed this reveal and thanks for visiting! Hello 2016! I took a break from my blog over the holidays so it’s been awhile since I posted. I hope everyone had a Merry Christmas and is starting the new year out on a positive note! I have an exciting little project to share with you all! I’ll start at the beginning..
I’m sure you have all heard of Annie Sloan chalk paint, right? If you want to learn more about it, visit their website here. I have made my own chalk paint now and then, mostly just to try something new. Eventually I will share those recipes with you, but for now let’s focus on Annie Sloan paint.. This past spring at the vintage fair, I met a lady from The Village Gift Barn (an outstanding place to visit if you are ever in the area) who kindly told me I can pick out a quart of Annie Sloan chalk paint, any color I wish! I guess she probably saw that I really enjoy painting and wanted to get me started on this chalk paint. The thing with this paint is you can’t get it just anywhere. You need to get it at a place where an Annie Sloan stockist is and I don’t know of any other place in the area that has it, besides the Berlin Village Gift Barn. They are great to work with there and very helpful. They also offer painting seminars and classes. So, after picking out a “Duck Egg” from the selection, I stuck the quart of paint in my paint cupboard and didn’t get around to trying it out until fall. My friend Linda gave me this little stand that she was going to pitch, and I knew that this was the piece I would use as my first Annie Sloan experiment. The green paint is an ugly, shiny, oil based paint from eons ago. The funny thing is the paint underneath that is almost identical to the “Duck Egg” I would apply. The top had an old floral print contact paper on it. That would definitely need to go too. First I removed the contact paper. I decided to go with only one shelf on the inside, so I tore out the shelf holders that I wouldn’t need. I also made a door frame. I thought that a little chicken fence door would complete the look I want. So now, the fun part.. I really really wish I could convey in a picture how it was to paint with Annie Sloan paint, but I guess that’s why I didn’t bother to take any pictures while painting, since I knew it was impossible. Let’s just say that with one coat of chalk paint, the ugly green color was gone! I was quite impressed! When I got the paint, the first thing I noticed was the weight of it. It was much heavier than regular paint. So, evidently there is something about paint that allows it to give better coverage, the heavier it is. To prove my point: The ugly stand had the same green paint on the inside as the outside and I used three coats of regular white latex paint to cover all the green on the inside, and only one coat of Annie Sloan on the outside! I didn’t sand down anything, just brushed it on with a regular bristle brush. I put fresh, new contact paper on the top. So… on a scale of 1 to 10, I would definitely give Annie Sloan chalk paint a 20 err, 10!! 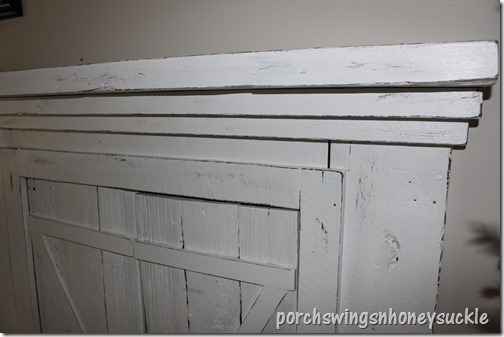 No, I won’t be completely giving up my other paint I use, but I do admit this chalk paint was more than I expected. I have since bought some more. (that’s coming from someone who waits to buy regular paint until it’s on sale, or even mistinted!) And I’ve also gotten some Annie Sloan wax that I will share more on later! Check back and don’t forget to like my facebook page or sign up with google connect for future updates!